Taipei and Singapore are great but both places can be a little too warm and humid for us. We were perspiring like crazy and now happy to be back for this nice and cool autumn weather. Apart from our preference for Melbourne weather, departing our family and friends in Singapore is always depressing and I hope that baking and eating Asian-style food can always make us feel better. This bread recipe is from the book, The Second book of Baking for Beginner by Carol. Although, I'm not very good in translating Chinese language, the nice photos of this recipe have been telling me that I have to bake this bread. To bake this bread, I think my nightmare now is to translate this Chinese recipe into English language. Glad that Google translate can help. 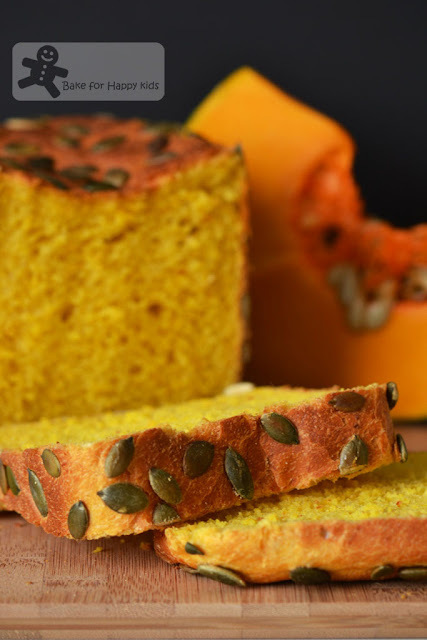 Although the bread is very rich in its colour, the pumpkin and honey flavours are lightly detectable and not very intense. I think that I might have over-baked the bread slightly as it became dry on the next day. Otherwise, we do like this bread especially for its nice and fluffy texture and unique taste but only on the day that it was freshly baked. Love this orange-y glow. Nice? Here's recipe adapted mostly from the book, The Second book of Baking for Beginner by Carol, original in Chinese language, now briefly translated to English. 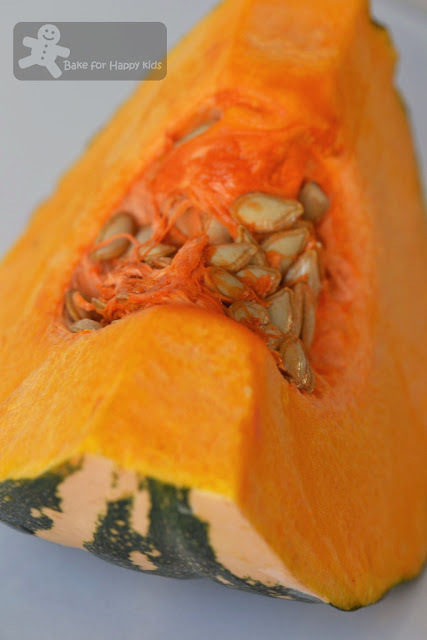 To make pumpkin puree, start by either steam or roast pumpkin pieces until tender. I have chosen to roast mine for a light caramelized taste. To roast pumpkin, place medium chunks of pumpkins on a baking tray and baked them in a preheated oven at 170°C (or 150°C fan forced) for 30 mins or until soft and tender when tested with a skewer. 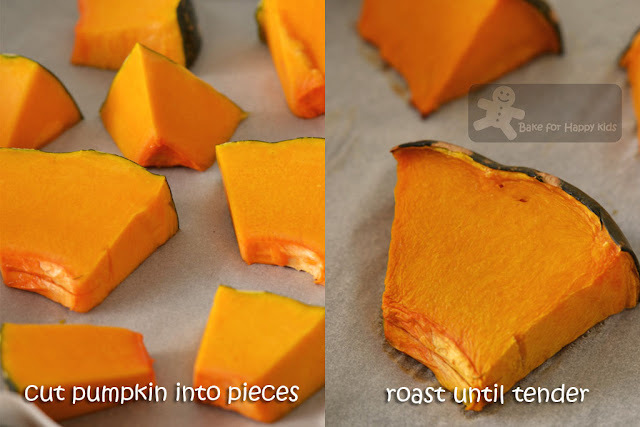 Trim off dried edges and pumpkin skins and set aside to cool. 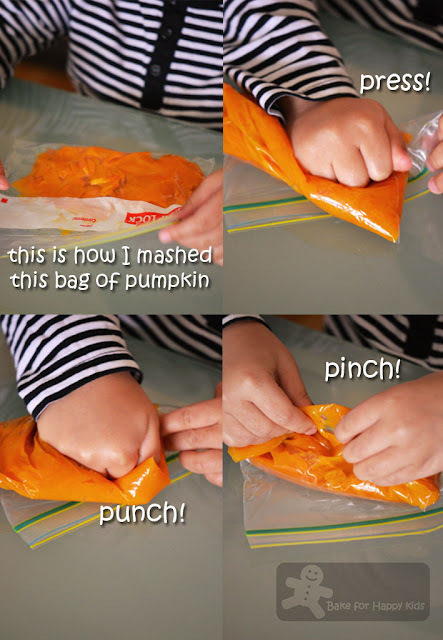 Mash pumpkin in a zip-lock bag or with a fork until smooth and creamy. Instead of kneading by hand as illustrated in the book, I've placed all my ingredients except pepita into my bread-maker and use "dough" setting to knead for at 30 mins and prove the dough for 1 hr. Roll out dough roughly into a 8 cm square flat dough. Roll it up and shape into log shape which is about 8 cm long and coat it thoroughly with pepita. Place dough with seam side down into lightly oiled baking tin. Prove for another 50-60 min or until the baking tin is 80% full. Preheat oven to 210°C (or 190°C fan forced). Place the cover of the tin when the baking tin is 90% full and bake for 40min. 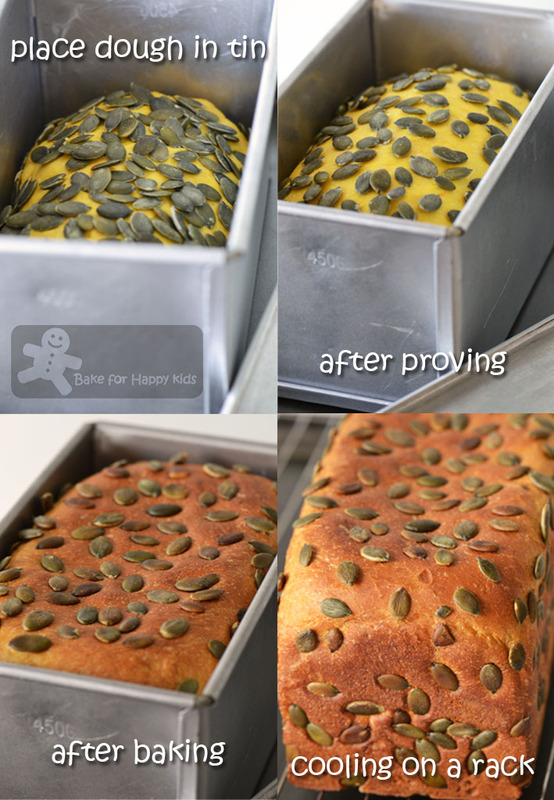 Remove the bread immediately from baking tin when it was baked and allow it to cool completely on a wire rack. This is such of nice orange-yellow bread, love it! That looks lovely, I too have baked a loaf of pumpkin bread! I have not got the chance to take photos as I was in a hurry to go out and when I got back, the loaf is already half devoured! And yeah, the weather is extraordinarily hot these days! This is a beautiful loaf of pumpkin and honey bread. Welcome home! Wow, what a rich, orange color! Beautiful! This bread looks amazing. Welcome back! This is a lovely bread, with very beautiful sunny pumpkin colour! I've made a recipe from Carol's website, and even with google translate, I am seeing stars and spinning! Haha! If only her books are bilingual, then I would be one of the first to stand in queue! So lovely you are back in cooling Melbourne, away from the crazily hot weather here! Zoe，guess u have a wonderful trip and welcome back. Hi Zoe, welcome back! The colour of the bread looks really lovely, I sometimes can't stand the weather here in Singapore too, so warm! Hello, Zoe! I thought there is another week to go before seeing you back! So glad to hear from you again! SO, did you buy a lot of things from Taipei? How was the late night market there? 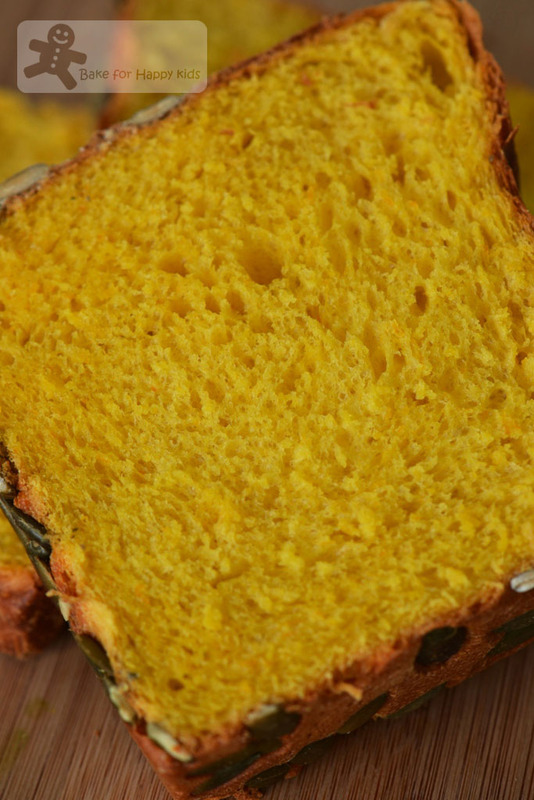 Ah, what can I say about your pumpkin bread, it looks as golden as the real gold, hahaha! Zoe, this yellowish bread is just too beautiful. I love pumpkin in everything. If I am going to try this, I know it won't be as beautiful as yours. Beautiful bread, Zoe! Love the colour and the sprinkled pumpkin seeds. The colour of the bread is tempting me to try out. can i bake the whole bread in the bread machine instead? will it be the same? Love the beautiful golden colour and the pumpkin seeds on them. It's such a gorgeous loaf! Hey Zoe ! How was your vacay ? ... I bet the our local library here has several copies of that book ! I need a translator though :P Pretty delicious bread , by the way ! I need a translator too and my husband is always busy to help. It really takes time for me to Google translate all these words by trials and errors... You can imagine! Hi Zoe! 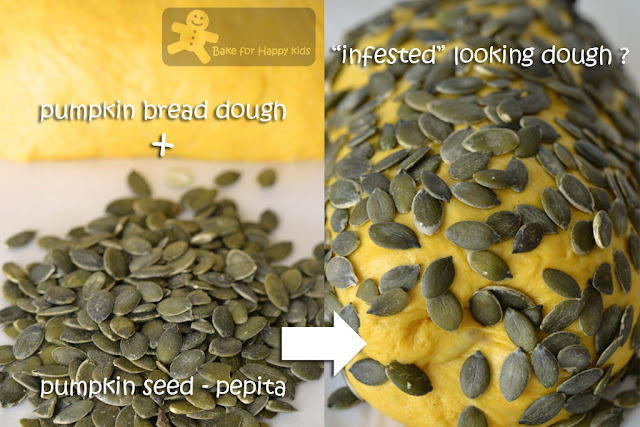 Love the pic of the orange dough covered with the pumpkin seeds! I can almost smell the bread from here! Nice to "see" you again. Welcome back! Looks wonderful, glad to see u back, even i dont like Singapore's weather. wow zoe! you sure have a wonderful blog! and can see you got a blackbelt in cooking. I am a big fan of pumpkin, anything about pumpkin sure fascinatd me. I love the color and the taste, usually make doughnut, cakes like bingka or turn it to soup...really yummeh! zoe, thank you for dropping by to my humble blog but regret you cant understand my language. and as I told you in my replies, I usually used the language as we speak daily here so I'm worried if you'll be head over heels and get meaning probably improper means when translated by google..
Great idea using the seeds as bread decoration! The colours have attracted me to this post, Zoe! Always good to be back in Asia, isn't it? I can imagine all the nice food made it more difficult for u to leave. Lol! Zoe，Great to see you again :) I believe you have a fruitful holiday with your family :)Your pumpkin bread colour looks fantastic. 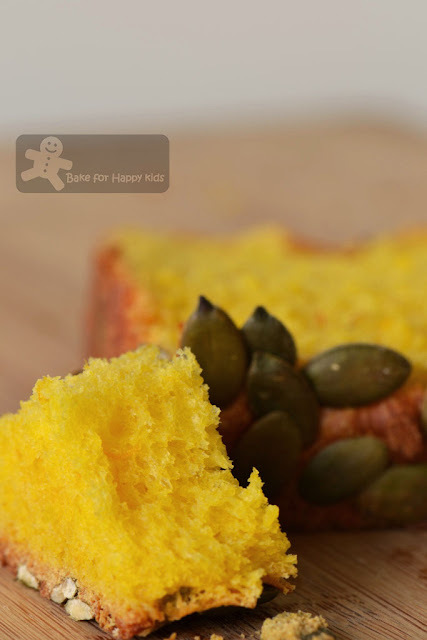 I got to grab some pumpkin tomorrow to make this bread :) Thanks for sharing ! Happy to have you back and with such a pretty bake, love those colours and your sous chef is such a big help:):) Sweet tiny fingers help mumma a lot. Lots of love. Love your brght glowing orangy pumpkin loaf. It looks pretty and of course yummy! !